This blog has been neglected over the past couple months. I'm equal parts ashamed and grateful, as I've been able to focus my energy on other things at a time when extra energy and extra time was sparse. I'm checking in tonight, though, in hopes that there are a few of you out there that still have this little blog on your feeds. And that maybe, those of you that do, find yourself with an extra minute or two to spare. You see, I'm in need of a favor. I need some prayer warriors to lift our family up this evening and again in the days and weeks to come. It is not my place to go in too great of detail at the moment but I do really, truly believe that the power of prayer moves mountains. Right now, we need one such mountain to be moved. I ask that if you are willing and able, please lift our family up in prayer over the coming days and weeks and help us as we pray for healing and peace for a loved one and our family as a whole. 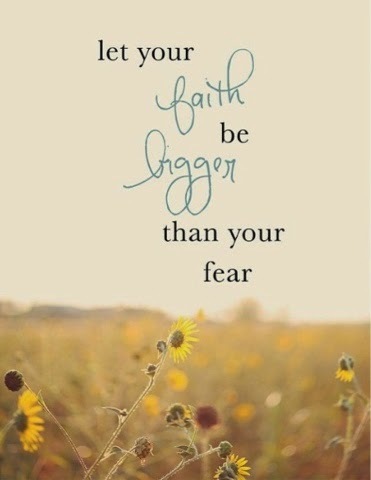 I am using the quote above to shape my thoughts tonight and remind myself that Faith is larger and greater than fear.